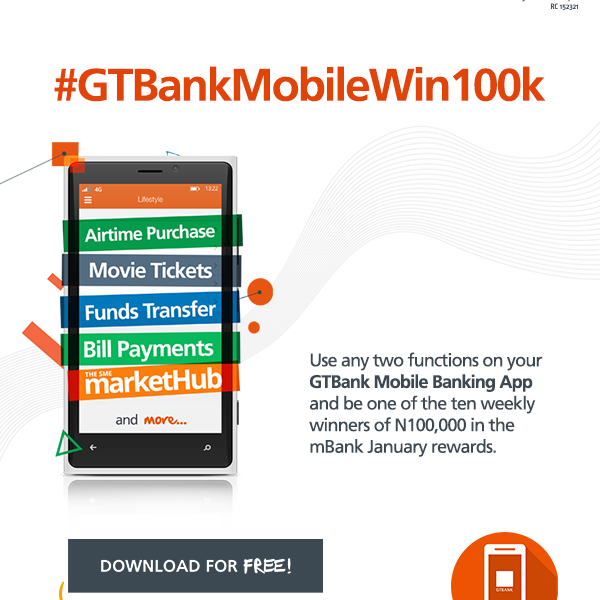 Foremost financial Institution; Guaranty Trust Bank (GTBank), has launched the #GTBankMobileWin100k competition to reward its mobile banking customers by availing them a chance to win N100,000 weekly in the mBank January rewards. The competition will run throughout the month of January 2016 and ten lucky customers will win N100,000 weekly during the period. To participate in the competition, customers are required to perform two banking transactions weekly on the GTBank Mobile App, such transactions include funds transfers, airtime purchases, bills payments and purchases on the SME MarketHub. Multiple entries are allowed and winners will be notified by telephone or email.